I am currently reading the first book in an alternate history trilogy by Peter G. Tsouras. 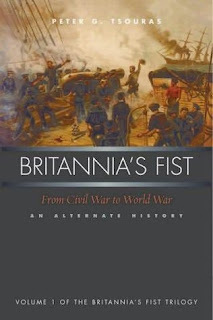 Britannia's Fist imagines a British entry into the American Civil War, specifically against the Union. Tsouras is a retired US Army intelligence officer. Although I've heard of his name before, I have yet to read his work. So far, several pages in, it is clear that Tsouras is trying to create a historically plausible scenario. This is the most important task in the writing of alternate history fiction. Harry Harrison wrote a similar trilogy, beginning with The Stars and Stripes Forever. I would describe it as wildly optimistic because every lucky break goes America's way. Nonetheless, it is fairly plausible and worth reading. That is most intriguing. I had never heard of that book before. It's available in full text through Google Books, so I might read it. Thanks for the pointer.